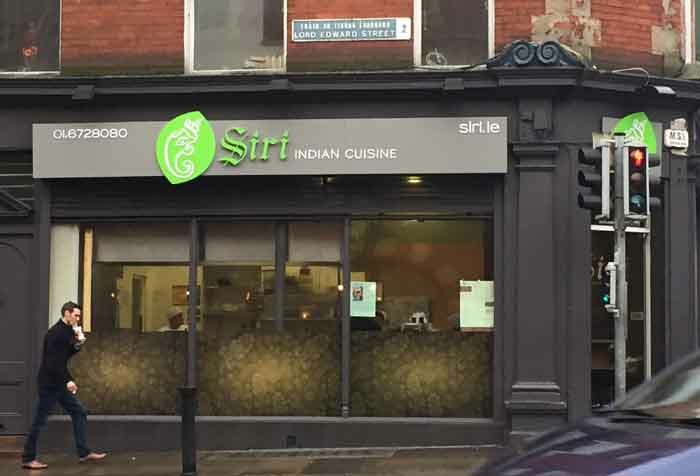 Siri is where Toki Doki was, at the top of Lord Edward Street, opposite Fishamble Street. I wrote about Toki Doki here, but I had the feeling even then that it might not survive. This particular premises has had a significant turnover of businesses over the years. It’s just a little too far away from the burgeoning restaurant zones at the bottom of South Great George’s Street, the middle of Dame Street, Parliament Street and Temple Bar to be noticed. 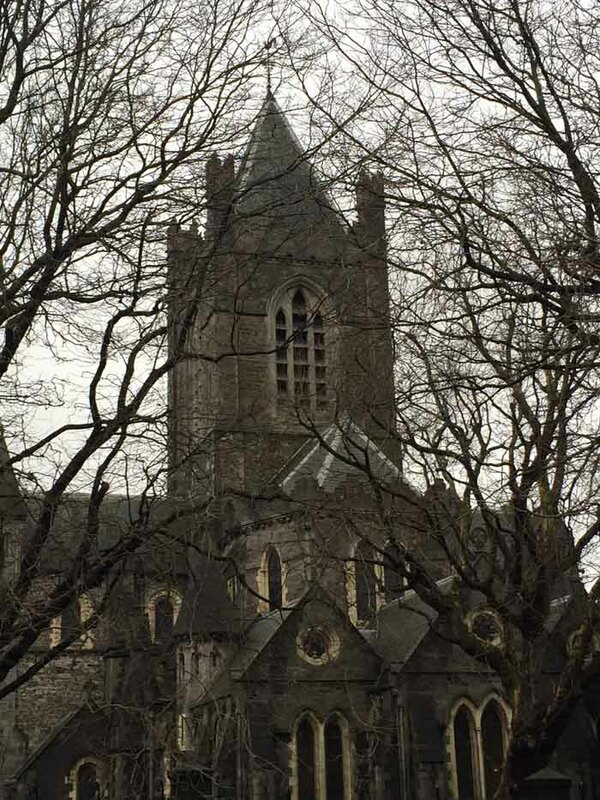 And it’s on the wrong side of the road to capture passing tourist trade from Christ Church Cathedral. Let’s hope that Siri does a bit better. 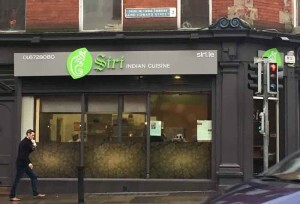 Siri (here’s its Facebook page) opened about four months ago. Lucinda O’Sullivan’s write-up (here) describes the people behind it, so I won’t. Inside, it’s small, clean and bright, with nice bold patterns on the walls. There’s a small counter, about four high stools, a small bench and the kitchen/ serving area. So, essentially, it’s a take-away. 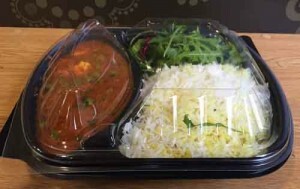 It also, unusually, offers a delivery service to offices at lunch time in what it terms ‘temperature controlled containers’. 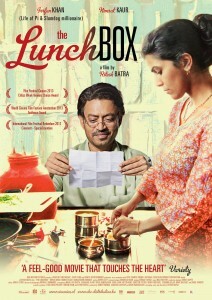 This fact brought to mind a rather touching film I saw last year, called ‘The Lunchbox‘. 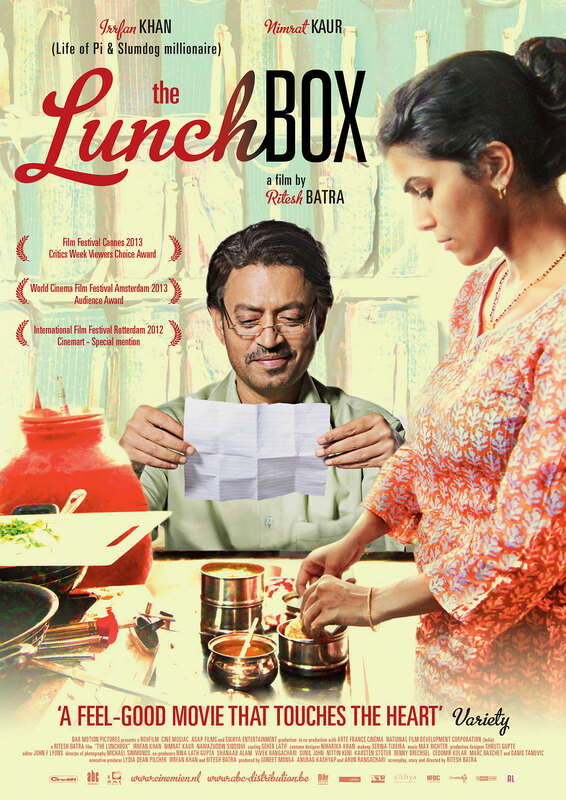 Set in Mumbai, it’s about the development of a epistolary relationship between a woman and an older man based on a rare mis-direction of a lunchbox in the famous dabbawalla system of lunch deliveries in the city. If you get a chance to see it – do. The menu that attracted my attention was the Lunchbox menu. 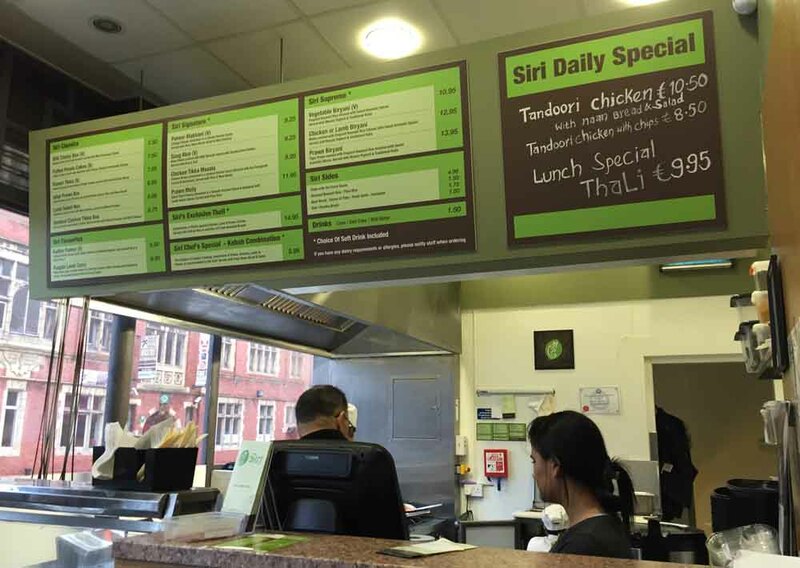 This image is from the leaflet available in the shop which explains the lunch box concept and also has slightly different pricing from the version on Siri’s website. 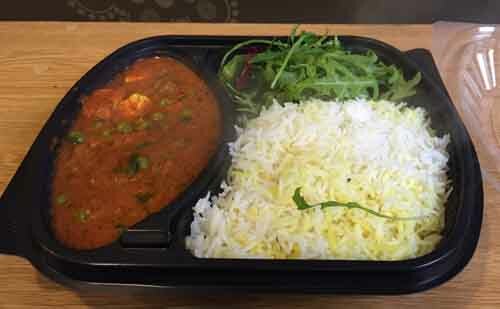 I went in ready to order the Vegetable Dhansak but ended up ordering the Mutter Paneer. Paneer, as you probably know, is a fresh curd cheese made from milk. In Mutter or Mattar Paneer, the cheese is combined with peas and is served in a tomato based sauce, accompanied by rice or bread. … steamy and inviting. The green stuff beside the rice is rocket, by the way. Undressed. I tucked in. Pretty good. Basmati rice, nicely cooked. Rocket, fresh. 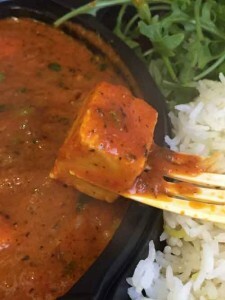 The paneer was firm and creamy. The peas were … well … peas, and the sauce was tasty and, without being critical, I would describe it as unexceptional. But pleasantly unexceptional. It had a nice chilli kick to it, providing a tingly mouth sensation rather than a blow your head off one. 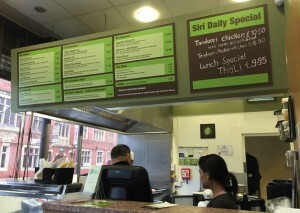 There was plenty of it, although I might have liked a few more cubes of paneer and maybe a spoon. But, as I’ve said before: hey, this was a plentiful feed and it cost a mere fiver. And that, in post-recession, let’s dust off the party hats and queue up to buy a house off the plans Dublin, is good value. And it seemed more so because it was a dirty day and because of the gracious and friendly way I was greeted and treated. If you’re in the area, pop in. And really, trust me, it’s worth a bit of a walk if you happen to be lurking somewhere further down Dame Street. I’m rather bowled over by this post! It’s been a few months since I last checked out eatforafiver, and it’s increasingly evident, as the the writing style of the site matures and the range of eateries expands, that: (a) historians, social scientists, aspiring novelists, and assorted fact-checkers will use the site just as they now use Ulysses (the J. Joyce version, obvs. ); (b) it is an indispensable resource for those currently eager to EFAF; and (c) your tv, cinema and world cultural references more than ever send your devoted readers scurrying for Prof. Google and assorted resources (the dabbawalla system of lunch deliveries in Mumbai / cromulent / contemporary Indian cinema).